You have quite an unusual attitude to travel. Do you like to travel light and travel alone? Yes. I find that travelling with possessions, money and preconceived ideas of where to stay and what to eat take away from the adventure, romance and wisdom that I seek in places away from home. I travel with two track pants, three T-shirts, a tent, a rope, a sleeping bag and rubber roll, some instant noodles and dry fruits and a budget of Rs100 a day—which is 10 times what I need in the mountains. With a rucksack, one can go anywhere, walk long distances and sleep in any terrain. This way I’m ready, whether I have to sit in the luggage carrier of a state transport bus on the narrow winding roads of the Himalayas, stay in a cave at Kheer Ganga while it rains or bathe in cold waterfalls—all of which I’ve done. In Manikaran, 2 hours from Manali, there were two ways to feed oneself: a Sikh langar (community kitchen) and petty shops that sell food to be prepared by the traveller. After eating langar one day, I decided to buy food. It came in a cloth bag tied with a long rope and comprised rice, salt and dal. I had to dip it in one of the nearby natural hot-water geysers for 20 minutes—and the food was ready to eat. It was the most delicious meal. The kind of holidays you like to do are also quite physically demanding. How do you prepare for a trek/white water rafting holiday? I train myself by carrying my packed rucksack on my morning walks and walk for 2 hours instead of one. I don’t find the need to do anything more strenuous as the mountains are quite patient and do not push you to walk fast or cover a certain distance. For white water rafting, I take cold water baths—the rides are cold and trying, if long—and also swim regularly. You mentioned that you initially planned to travel alone to the Tons, then your son and his friends joined in. That’s right. I have a little hobby: I like tracing the source of rivers. I had first gone to the Tons area on my own, to trek along the Kheer Ganga route to Mantalai, which is the source of the Parvati river—it is said that Lord Shiva spent 40,000 years in meditation here and that he created the disease-curing natural hot-water spring here to pamper his wife, goddess Parvati. The next year, I went back there with my wife for a week-long trekking and rafting trip. I love the fact that there’s a river here, gurgling 24 hours a day; there’s thick green cover that makes walking a pleasure even when the sun is up; and there are barely any roads, which means you’ll encounter only like-minded people. 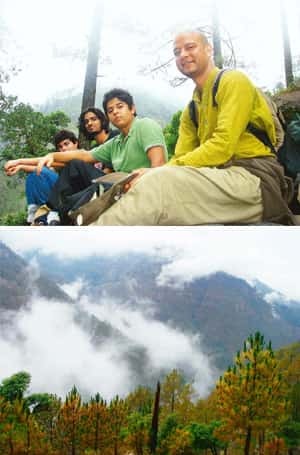 Last year, when I was planning a trip again, my son Zarif and his school friends Nishant Jacob and Abhimanyu Arni—all 16-year-olds from the Mallya Aditi International School, Bangalore—wanted to come along. These teenagers were free of all baggage and needed no looking after, so I was as free as I could have been. They were a treat to be with, full of stories, mischief and energy. It was delightful to have such young company. They made me run and do things I wouldn’t have done otherwise, like jumping off cliffs into a cold water lagoon, navigating waterfalls and walking barefoot in leech-infested areas. Did you head straight to Tons? No, we went to Delhi by air and then to Rishikesh by train. Then we drove 7 hours to Kuflon, a beautiful valley in the lower Himalayas. We spent three days here trekking. There are small hills here, forests and water bodies. We camped on the hillside in our igloo tents—we were carrying two to accommodate the four of us—ate what we had carried and just gave ourselves up to silence. Then we drove to Tons, where we stayed at the Aquaterra campsite. Though we did not join any group, we appreciated the professionally run campsite and rafting expeditions. Rafting, especially, does need experienced safety instructors and a safety canoe. Didn’t you have a fixed itinerary? No, we stayed pretty much free from an itinerary and took the decisions day by day. This flexibility is necessary if one does not want to end up with yet another structured vacation. There’s a beautiful lake about 40 minutes away from the camp, so we would trek there every day for a swim and walk back. The landscape around is not too demanding, and lends itself to good day trips and hikes, which we took up. There’s a temple nearby which the Pandavas are believed to have built during their exile, and there are some iron balls which Bheem is said to have played with—I found it impossible to even lift one! We also trekked to what had been pointed out to me on an earlier trip as the tallest tree in the region, at some 369ft, but I found it had fallen down…that was disappointing. We did three rafting trips down the Tons river, half-day journeys consisting of many groups of Class III rapids (although to my son and his friends, who were first-timers, it felt like a much higher class). The rafting trip was technical, with every person handed the equally important task of keeping the raft afloat. All of us are good swimmers and I think we handled the pressure quite superbly. The water was cold and it took the first 10 minutes of the journey to get used to the freezing splashes. There were many drops and rocks in our path, each of which was thrilling. On our last trip, our raft got stuck between two rocks and we found ourselves perpendicular to the flow of the river, with water flooding our boat. After 10 seconds of sheer panic, we realized that not only were we knee-deep in water, but Abhimanyu had found the time to throw himself out of the boat. Rafting is now one of my son’s favourite extreme sports. What was your biggest takeaway from the expedition? Introspection. I got closer to knowing who I am, what I am up to, and where I want to be. These trips remove the toxins from my digestive system, as I live on little food or fruits throughout. As for the boys, I think they learnt to be with themselves. One morning, Zarif, for instance, spent 4 hours watching the river...and came up to me and said that he could feel the sky and the earth becoming one, and he was becoming one with them. For a 16-year-old to come up with that, I think he had to get really close to nature. Kuflon is around 385km from Delhi and best reached by road via Ghaziabad, Haridwar and Uttarkashi. Alternatively, take the Dehradun Shatabdi from New Delhi (departure, 6.50am) to arrive in Haridwar at 11.25am. A taxi to Kuflon will cost upwards of Rs2,500.